I’m on a roll with the date-sweetened desserts. Since many people are already loving the date-sweetened brownie recipe I posted last week, I thought I’d try my hand at sweetening another favorite dessert with dates: peanut butter cookies. 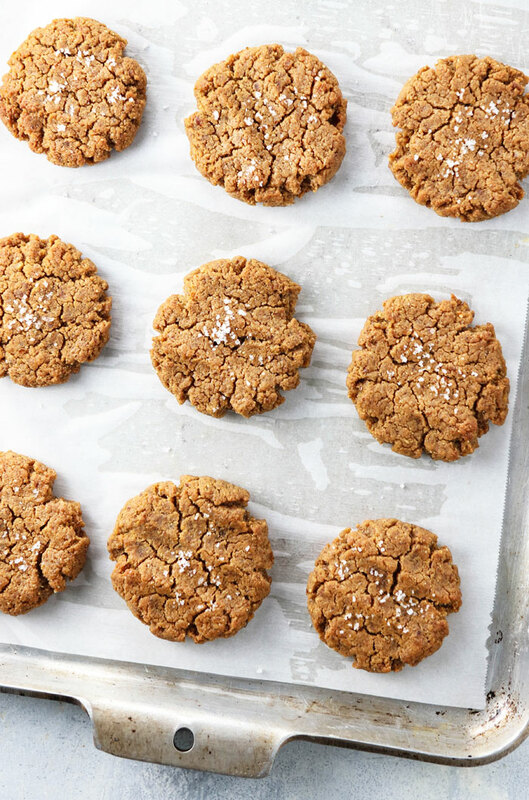 You know those super-easy peanut butter cookie recipes that call for only three ingredients? Usually it’s something like 1 cup of sugar + 1 cup of peanut butter + 1 egg. I’ve made that recipe numerous times using coconut sugar and a vegan egg, so it got me thinking… what if I substituted one cup of dates for the one cup of sugar? Could it be that easy?? The simple answer is, yes. It’s that easy. This recipe is one of the easiest and healthiest cookie recipes I’ve ever made. It calls for slightly more than 3 ingredients because I wanted to add a splash of vanilla for flavor, and a touch of baking soda and vinegar to help them rise, but they still have a short ingredient list and quick preparation. They’ve passed my picky 3-year-old’s taste test with flying colors, so I hope you’ll love them, too. 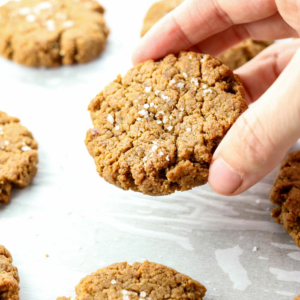 A healthy cookie recipe naturally sweetened with only dates. They are moist and delicious! If you don’t need this recipe to be vegan, I think you could swap a real egg for the “flax egg.” Simply omit the flax seeds and water and use a real egg instead. As always, please leave a comment below if you try making any modifications to this recipe so we can all benefit from your experience. Reader Feedback: What’s your favorite type of cookie? My dad’s favorite is Oatmeal Raisin, so I’m thinking of tackling a date-sweetened version for Father’s Day! Is the ACV for rising or something else? Can i use baking powder & omit baking soda & Acv? Yes, it’s just for rising so you can use baking powder instead. Always love to show off good vegan baking especially in an effort to convince people they don’t need to eat animals or eggs. I feel so good not eating that stuff and want my friends to taste good vegan food. This is great addition to my holiday party! They are delicious and so easy! Thank you! These are amazing. I’ve been making them now for several months. Sometimes I add Lilly’s stevia sweetened chocolate chips which makes them extra tasty. Thanks so much for this recipe! This is my go to cookie recipe. Thank you so much! I usually use almond butter and vary the dried fruit… Raisins or figs… And I often add in slivered almonds or coconut. I probably make three double batches a month! These were completely yummy! Thank you! Loved this recipe, made it with a couple of minor additions the first time around. + 1 tablespoon of cocoa powder, + 1 tablespoon of water, + 1 tablespoon of toasted sesame seeds. Add the sesame seeds in at the end to add some crunch. Still can’t believe these don’t have any flour in them. Thanks so much for sharing. I made these with almond butter (Kirkland brand from Costco), an egg, some Real Salt and chocolate chips and pecans. They are really delicious, decadent and moist. Perfect with some coffee or milk. Thanks for this great recipe! I’ve also made them previously with peanut butter, but my sweetheart doesn’t care for peanut flavor so I wanted to try almond butter. I love the peanut butter ones, too! Especially with a little bit of dark chocolate drizzled on them. Not sure I’ll ever make regular cookies again. I’m not sure what I may have done wrong??? I followed the recipe as written, my burnt beyond salvation after 13minutes. The second batch I baked for 8 minutes and they’re pretty close to being burnt. I used a freshly stirred jar of TJ’s smooth peanut butter and an egg, not the flax seed and water. Could that be why? BTW, your Vegan Almond Flour Chocolate Chip cookies, DELICIOUS!! I baked them at 250 for 30 mins, pure perfection. These cookies are really good and I don’t feel bad about eating them!!! I put 6 table spoons of water. easier to blend the cookies were hard on the outside and so soft on the inside.. I love this recepi thanks so much. i made these with 25% almond butter, 75% crunchy peanut butter. Fantastic! Thanks for the great recipe! These cookies were delicious – especially the next day after the flavors had a chance to meld! Please keep the date-sweetened dessert Recipes coming! These are great! I made them with half PB and half almond butter (because i didnt have a full cup of pb) and used a chicken egg inStead of a flax egg. They have a great taste and nice, moist texture. Be warned: these little dough balls are very greasy before baking. The resultant moist cookies make it all worthWhile. i had never baked with large amounts of dates as the sugar before, and although I liked the texture of these cookies fine, i wasn’t a huge fan of the flavor. 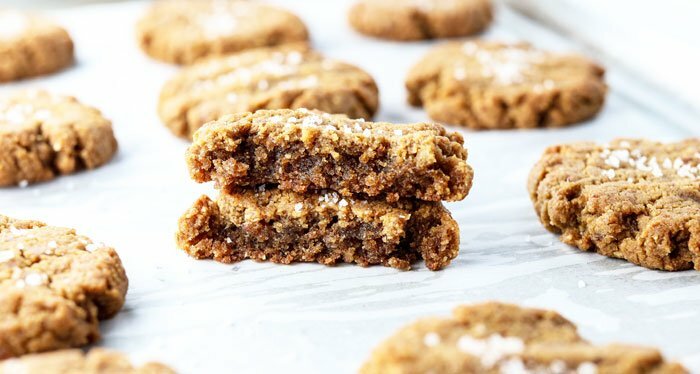 the dates seemed to overpower the peanut butter, and since I like my peanut butter cookies really peanut-buttery, i think I will stick with the more neutral coconut sugar going forward. it did get me thinking about how much i miss fig newtons — damn my gluten allergy — and made me hopeful that your blog or next cookbook would tackle that specific recipe. Until then, I will be popping trader joe’s new organic dried figs like adderall. I don’t think apples would bind the cookies as well as flax or chia seeds would, but let us know if you try it! This look great. I was actually craving cookies for breakfast this morning. Then I look at my email and see this post. The Universe always has a way of answering us. I look forward to giving these a try this weekend or tonight. The ingredients are quite healthy. Ill be trying this recipe out. LOVED these! My son has FPIES (food protein induced enterocolitis syndrome), and can’t have dairy, soy, wheat, oats, bananas or avocados. It’s hard to find fun treats for a 3 year old with those cut out. He LOVED these! I need to figure out the cooking time exactly with my oven, because mine burned a little on the bottom after 13 minutes. They still tasted great and we’ve been fighting over them the last few days. 🙂 Thanks!! 3 year old boy approved! I love how simple + delicious these cookies look! Must try these! ? These were so good. I added 5 stevia-sweetened chocolate chips on top of each cookie, and this was unnecessary decadence, but very nice when you have them around. I baked them the first time for 20 minutes because I love a well-done cookie, but yes, 14 minutes turned out to be tastier even for me. Also, I later made a version with almond butter and added 1/2 tsp almond extract to the recipe, and my roommate and I liked them even a bit more. Such a great recipe! I’m so grateful to have something so delicious that’s truly healthy, not to mention easy. Also, if you don’t have medjool dates, adding another tablespoon of water to compensate for the dryness of the dates worked well for me. Yummy! We love these straight from the freezer. In a pinch, these would make a great breakfast on the go, much healthier than stopping off at Starbucks or Dunkin Donuts. I don’t eat peanuts and have been trying to figure out what else might be good for these. What do you think about tahini? Would it work? Holy cow! Tahini and cinnamon! Delicious! Just wondering how you measure the dates. Are they diced or left whole, and are they put in the measuring cup loosely or packed down? Good question! I leave them whole after removing the pit and pack them down in the measuring cup. If you want tp use a food scale instead, I’ve found that one packed cup of dates is usually 8 ounces of pitted dates by weight. Just made these cookies with my kids. Love them! Thanks for another great recipe! Looking forward to making these cookies. Your recently dates recipes as the sweetener in cookies, would it work with your flourless peanut butter cookies in place of the honey? Substitute the same amount? Those have always been my favorite. Thanks for all your recipes! 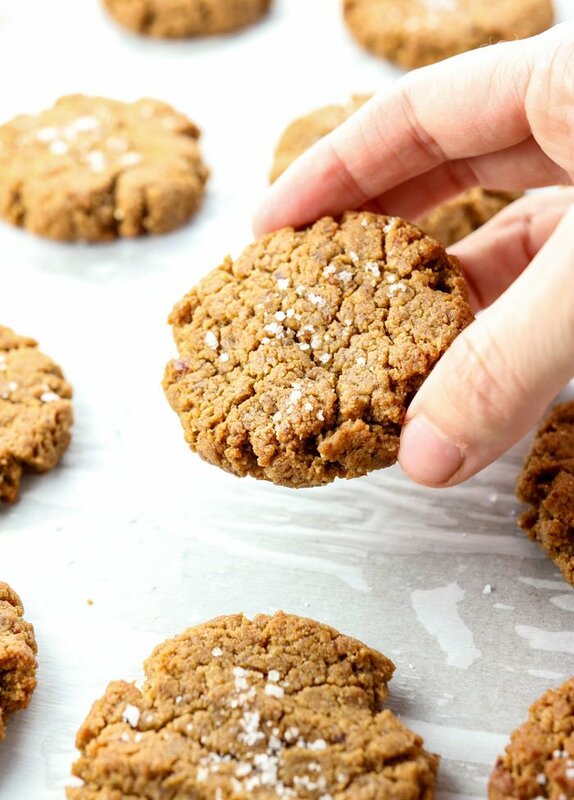 My flourless peanut butter cookie recipe with honey is very similar to this one already, so I would make sure you use equal parts dates to peanut butter for them to turn out well. I am so loving your recent vegan recipe streak – please please keep them coming!! I haven’t been eating eggs lately, meaning baking has pretty much not been an option (sad face) which is why I’m so excited to try all your new stuff! I’m sure they’re great, as are all your recipes 🙂 Thanks again Megan! I’ve always wondered, and maybe you know….can you sub other types of dates for medjools? I imagine other types of dates would work well, but I haven’t had the opportunity to try them yet. I would measure out 8 ounces of dates, or a tightly packed measuring cup, to keep things consistent. Oh, I can’t wait to try these! I LOVE date sweetened desserts, so I’m really enjoying your recent posts! I’ll probably try these with a chicken egg… and maybe add in a few chocolate chips because PB and chocolate is my favorite combo ever! 🙂 Thanks so much for posting this! Can wait to try these. You are so creative. Thanks for all of the great recipes. Also love your books!!! Can I use the PB Fit or PB8 powder instead of peanut butter for less fat? Hmmm… I haven’t tried that so I have no idea. The fat in the peanut butter might be important for these cookies, but I couldn’t say for sure. Let us know if you try it!! I tried it! It worked for me! Delicious!! Next time I want to try it with some oats or something though because I didn’t really feel any health benefits. Do u have the nutritional info including sugar? These cookies are very easy and delicious!? These cookies look so delicious! Can’t wait to try them without feeling guilty!